Participating in a string art class is a calming activity that teaches geometry through art. 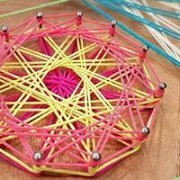 String art stimulates and increases brain function and helps develop fine motor skills. During this class, children are introduced to string art and the skills that accompany it. Wooden boards with random pins are prepared for children to use their imagination and create their designs using colorful woolen threads. To Register for this class, please call 71-203930 or on www.hands-on-bey.com 24 hours prior class date.